The ponderosa pine was believed to be more than 500 years old. A giant among giants and a beacon for countless tourists driving through the Columbia River Gorge is dead. The accurately named Big Tree, a massive ponderosa pine near Trout Lake in the Gifford Pinchot National Forest, was hundreds of years old. A mammoth conifer, the Big Tree contained about 22,000 board feet of lumber — enough wood to frame almost one and a half 2,400-square-foot homes. Although it was one of the oldest and tallest trees of its kind, and for decades the centerpiece of an interpretive site for travelers headed to Mount Adams, the Big Tree died with little fanfare last year. Jon Nakae, a silviculturist in the Mount Adams Ranger District, wrote it an obituary, but stopped short of publishing it for fear of making light of a particularly sensitive section of local newspapers. No one from the U.S. Forest Service is quite sure of the tree’s age. The web page devoted to the Big Tree pegged it at about 370, but Nakae thinks it’s likely much older. “It’s probably well over 500 years, gauging by the size,” he said. The most accurate way to know its age would be counting its rings, but Nakae said he doesn’t have a core sampling tool long enough to get all the way through the Big Tree’s trunk. To make matters worse, parts of the tree’s interior are rotten, which hampers counting tree rings. The Forest Service could cut it down to know exactly how old it was, but Forest Service officials said it’s worth more standing. Using those age estimations as bookends, the Big Tree had barely taken root when Martin Luther nailed his “95 Theses” to the door of a Catholic church, thereby launching the Protestant Revolution in 1517. Or maybe it began growing roughly two years after the Ming Dynasty of China came to an end in 1644. It survived an untold number of forest fires and the estimated magnitude-9 Cascadia earthquake of 1700. Much like the Europeans who started colonizing the eastern United States when the Big Tree sprouted, ponderosa pines are pioneers. They’re among the first vegetation to return after a forest fire because they do well in direct sunlight and prefer dry weather conditions. Ponderosas generally are considered by federal officials and academics to be the most widely distributed pine in North America. They’re typically found in the Intermountain West rather than on the west side of the Cascade Mountains. Ponderosas prefer drier, warmer conditions rather than the humid forests of coastal areas. The Trout Lake area that the Big Tree grew in was probably near the end of the ponderosa’s tolerant range. But the Big Tree may have benefited from growing relatively close to the coast. “Its location may have been beneficial because it got more moisture than its eastern counterparts,” said Kevin Zobrist, associate professor of forestry at Washington State University. 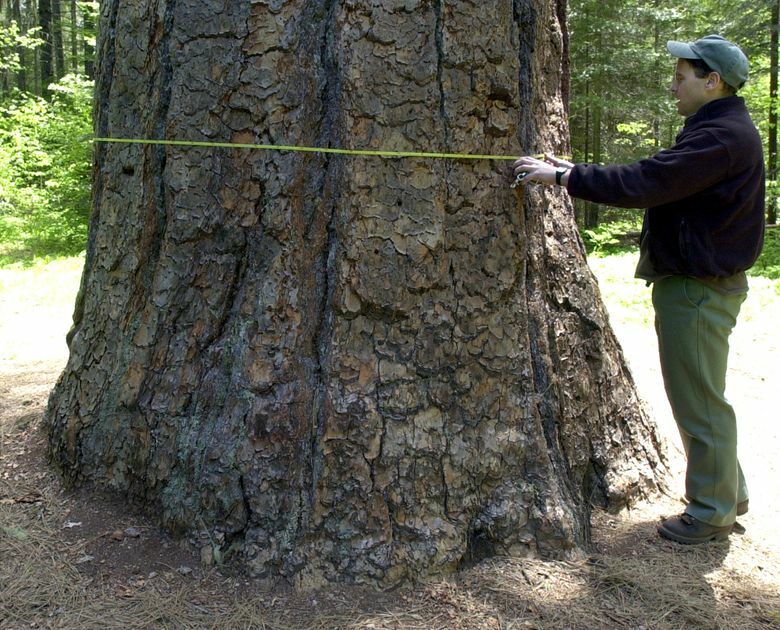 According to the book “Champion Trees of Washington,” published in 1996, the Big Tree was 22 feet around and 213 feet tall, though Nakae said it was 202 feet tall in 2015. 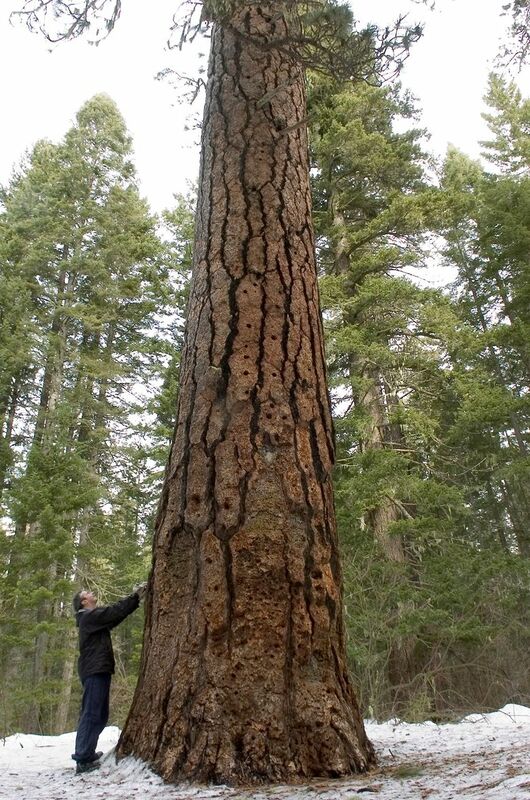 The Big Tree wasn’t the biggest known ponderosa alive on Earth, but it might have been the tallest. A ponderosa on the Yakama Indian Reservation, which also recently died, was shorter but considerably stouter and thus the biggest ponderosa in Washington state. At more than 500 years old, nearly 29 feet around and 162 feet tall, the world’s largest known living ponderosa, named Big Red, sits in Oregon’s La Pine State Park. Its girth made it bigger, but the Big Tree towered over it by about 40 feet. Ponderosas typically live between 300 and 600 years, Zobrist said. So at possibly half a millennium old, the Big Tree was well within its twilight years. It wasn’t climate change, a rampant infestation from an invasive species or ravenous beavers that finally killed the old giant. For the last several years, the tree was in rough shape from the stresses of old age, a regional drought, an untold number of insects chewing away at it and perhaps years of visitors compacting the soil around its roots. But the death blow, Nakae said, likely came from a Western Pine beetle attack, which started about three years ago. A younger, healthier tree often can successfully fend off a beetle infestation, but the Big Tree’s vigorous days were well behind it. “It was really evident the beginning part of last summer, the crown started to fade,” he said. Now the Big Tree might be more aptly named the Big Snag. The Forest Service closed the picnic area near the base of the tree to protect the public from any falling dead branches. But because it’s leaning away from the road and because it’s valuable to wildlife, it will be left standing. “Ironically, the tree can provide more life in its death than it did when it was alive. Forty percent of our species rely on dead trees for habitat,” Zobrist said.